​While not all transportation projects in Pennsylvania fall under PennDOT's jurisdiction — many are the responsibility of your county or local government — we are very much invested in working with all our stakeholders, planning partners, and our communities to determine how we can improve transportation for all Pennsylvanians. Every two years, state law requires PennDOT to submit to the State Transportation Commission a program of transportation improvements spanning the next 12 years. 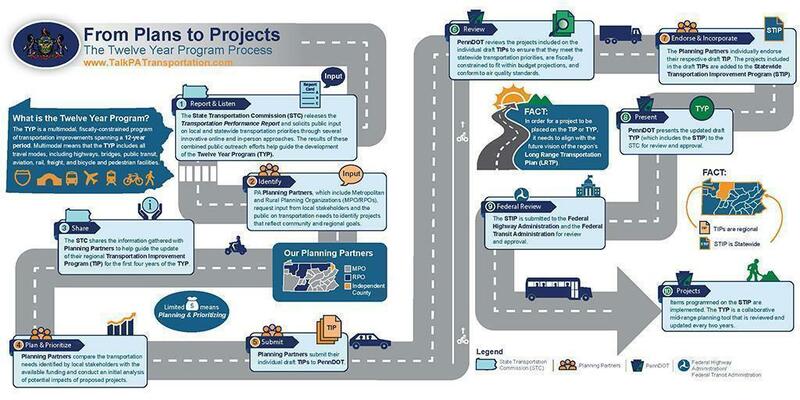 The STIP — or Statewide Transportation Improvement Program — reflects the first four years of the Twelve Year Program and covers the entire state, including our 24 planning partners' regional Transportation Improvement Programs. The first — and arguably one of the most important steps — in the Twelve Year Program process (PDF) is when the State Transportation Commission releases PA's Transportation Performance Report and solicits public input on local and statewide transportation priorities. It just so happens, the latest Transportation Performance Report was released in February. It shows what we've accomplished with our current resources, as well as what we plan on doing moving forward. Our public survey to gather input from YOU — our most-important customer — is open through April 19. That gives you one more week to let us know what matters most to you when it comes to transportation needs in your community. After PennDOT reviews input from the public, we work with our other planning partners, the Metropolitan and Rural Planning Organizations, to identify projects that reflect community and regional goals, update their regional TIPs and then get those projects added to the Statewide Transportation Improvement Program. In addition to the Twelve Year Program, PennDOT has implemented two programs in recent years to help increase funding so we can improve even more roads across the state. Act 89 was signed into law in 2013 and invests an additional $2.3 billion to $2.4 billion into transportation by the fifth year of the plan. Just this year, the the Wolf Administration announced its Road Maintenance and Preservation (Road MaP) Program, which will invest $2.1 billion in maintenance and highway and bridge capital projects over the next 10 years. Want to know what's happening NOW in your community? You can view our current project list (PDF) or visit projects.penndot.gov to view an interactive map. More information on PennDOT's Twelve Year Program and long-range planning can be found on www.talkpatransportation.com. And remember, if you want to have a say in what happens in your community, take our public survey by April 19 or by emailing ra-penndotstc@pa.gov.